Hanoi is Vietnam's capital and second largest city by population (7.7 million in 2015). The city mostly lies on the right bank of the Red River. 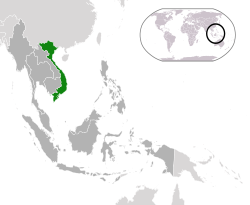 Hanoi is 1,720 km (1,070 mi) north of Ho Chi Minh City and 105 km (65 mi) west of Haiphong. Ho Chi Minh City is the most populous city in Vietnam with a population of 8.4 million (13 million in the metropolitan area) as of 2017.Located in southeast Vietnam, the metropolis surrounds the Saigon River and covers about 2,061 square kilometres (796 square miles). Phú Quốc island is undergoing massive construction to accommodate the recent flood of domestic and foreign tourists and is predicted to become Asia’s top vacation destination in the coming years. However, with tourism comes trash, and unfortunately plastic waste is increasingly being washed ashore. Phú Quốc is home to dense jungles and stunning waterfalls and the northern beaches are still relatively untouched by tourism. Translated as “The Bay of Descending Dragons,” this iconic Vietnamese landscape deserves its fame. Embarking on an overnight cruise though the azure waters is an experience like no other. Sunsets over the bay are magnificent and the mist rising off the waters adds an eerie, mysterious element to this geological wonder. It’s the number one tourist destination in Vietnam so it can be crammed during high season, but gazing at the limestone formations in the water is worth it. Located near Vietnam’s border with Laos in the north-central province of Quang Binh, Sơn Đoòng Cave is known as the largest cave passage in the world. Stretching more than 5 k.m. and large enough to house an entire block of New York City, Sơn Đoòng Cave is an unparalleled adventure.